In fleet operations, vehicle idling is unavoidable and even necessary for some industries. Service vehicles completing multiple job visits may idle in traffic or outside of a job location. Utility vehicles and law enforcement vehicles may idle for longer periods of time as drivers utilize the vehicles as mobile offices. In any case, idling can have negative effects on the bottom line and is an area fleet managers should to pay close attention to. 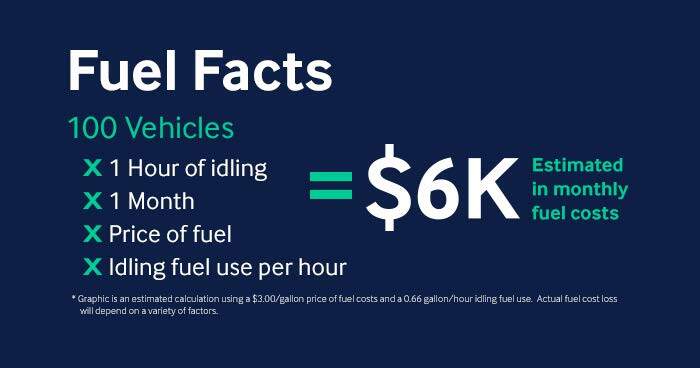 With a fleet of 100 vehicles and fuel cost of around $3 per gallon, daily idling of one hour a day per vehicle can result in nearly $6K in fuel cost losses a month. When multiplying across even larger fleets, fuel cost losses can put a real dent in operating budgets. Though tackling the challenge may seem difficult, Derive’s fuel efficiency optimizations for idle management can deliver significant improvements automatically. To make improvements during idling, Derive’s direct connection to the vehicle applies safe and reliable optimizations to reduce idle RPM so that the vehicle uses fuel more efficiently. Fuel usage during idle may be lowered by up to 30 percent, significantly reducing fuel costs, increasing miles per gallon and improving the carbon footprint of the fleet. Importantly, no driver training or behavior change is required to achieve the results. Such optimizations to idle have been completed by national brands such as Dish Network, USIC and Loenbro resulting in millions of dollars saved in fuel costs annually. Idle reduction optimizations are completed with the Derive solution within one 15-minute installation and without driver intervention. Fleets desiring visible insights into the outcome of the optimizations by way of vehicle performance data can utilize the Derive Mission Control Dashboard to view idle use by region, division and driver level. Derive’s solutions provide a holistic solution to improving fuel use and costs. Whether it be a small, medium or enterprise sized fleet, fuel costs can impact the bottom line.In order to guarantee fuel cost savings, managing the vehicle idle RPM is essential and with Derive, it’s attainable.